Additional settings need to be configured to allow iChat video through a Fortinet / Fortigate firewall. So there is a huge difference between how Nikon Capture NX 2 and Apple Aperture processes Nikon NEF (RAW) files. Here is a screenshot. No adjustments have been made to the file. The same file was opened in both applications. Click the image for the full resolution file. Hating slow DNS servers, I’ve been using OpenDNS on my laptop and servers. I didn’t realize a problem until I tried to connect to the Internet from the iPod Touch. 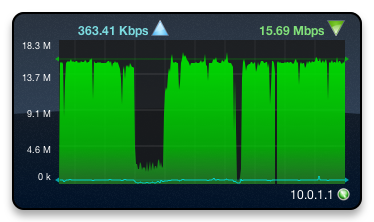 Turns out Time Warner’s DNS servers had problems. This isn’t the first time it has happened to me. The wireless router was quickly re-configured to use Open DNS’s servers (208.67.220.220 and 208.67.222.222), and this solved the problem. I can’t believe how easy it is to monitor an Airport Extreme base station with SNMP enabled using iEyeNet. After spending a couple of hours working on another NMS, I stumbled upon iEyeNet. It automatically detected the Gateway IP and used the default snmp community (public). Our folding@home team is now ranked in the top 7% 1% of all folding teams. If you would like to dedicate idle processing power, or PS3 cycles, please join team number 93280. The cause is worth it. I’m rendering Shake and slamming the CPU’s. With the computer at nearly 100% utilization, the performance with other applications is barely impacted. I like this error on the Drupal site. This is the first time I’ve seen an error with info on the load balancer. Drupal is a free and open source modular framework and content management system (CMS) written in the programming language PHP. Like many modern CMSs, Drupal allows the system administrator to create and organize content, customize the presentation, automate administrative tasks, and manage site visitors and contributors. The install is running, and I can’t wait to get this setup. 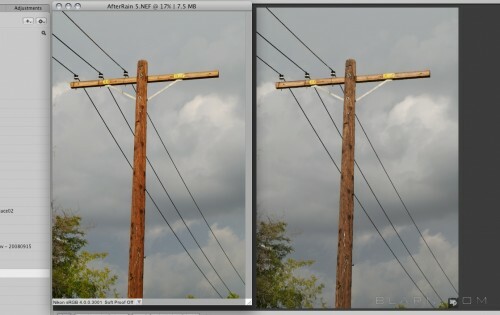 With multiple snapshots, recreating environments for troubleshooting or proof of concepts will be a breeze! This will create the file savefile.iso.cdr When the process is complete, simply remove the .cdr extension and you have an iso file. I just tested this with VMWare 2.0, and the ISO didn’t work with the OS X Server install. The only way I got it to work is to use the DVDs that shipped with the Intel Xserve. 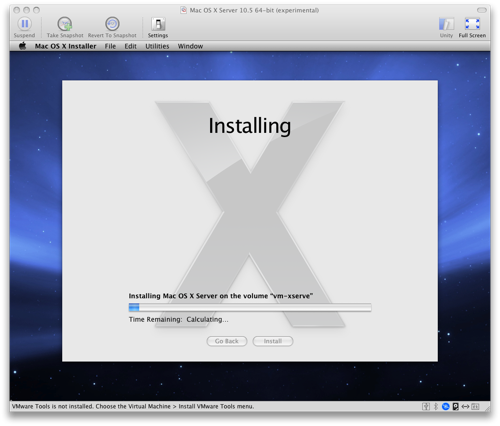 As I type this, “Mac OS X Server 10.5 64-bit (experimental)” is loading! 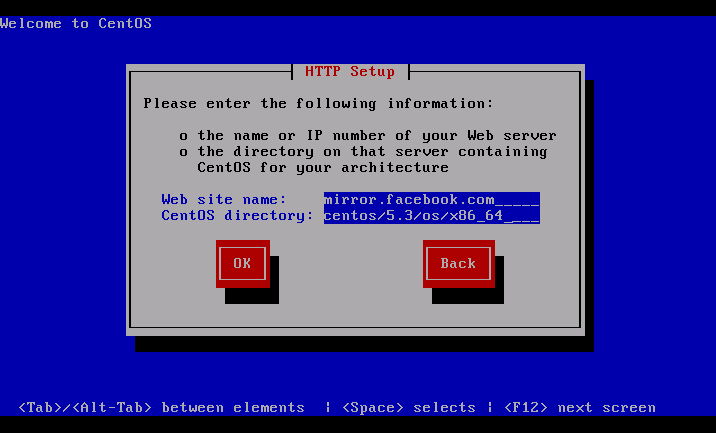 Facebook has a great mirror site for the CentOS ISO’s. This has been one of the fastest mirrors I have found for CentOS. It’s nice to see a social networking site giving back to the Linux community. If you access the Internet through a proxy, then you’re out of luck… Another option is to create a mirror server on your LAN. This may be a necessary step when configuring a Google Apps account on Mail.app. I needed to run this because I was frequently switching between different ISP’s without closing my mail program. The mail error reported there were too many requests for the account, and the Gmail account became unavailable. You may not need to run the captcha, but it seems to help solve this issue. Congratulations to Andreas Wacker and Interdubs for passing the 100,000th file mark today! Interdubs is a collaboration platform which can easily help you keep your clients up to date on the progress of their projects and allow prompt and efficient client feedback. Interdubs works native with the iPhone, plus it allows you to easily create reels for clients to review. Keep up the good work Andreas!